Thanks to blog reader and exercise specialist Mike Wigger for sending along the latest in Coca-Cola's anti-obesity ad campaign. It's a commercial called, "Grandpa", and in it they juxtapose Grandpa's then life (which according to Coca-Cola included more walking, smaller meals, biking to work, snacking on fruit, taking the stairs, enjoying the outdoors, homemade meals, eating at the dinner table) with his grandson's now life. 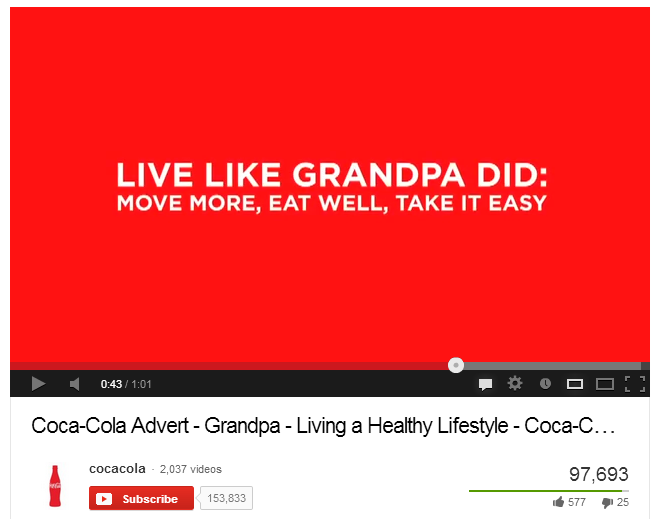 And of course the commonality between Grandpa and his grandson's lives in the advertisement is that Grandpa apparently also enjoyed Coca-Cola with the clear implication being that it's all those other things, not the consumption of Coca-Cola, that a person ought to change if they want to enjoy the same weight and health as Gramps. But is Grandpa's Coca-Cola the same as your Coca-Cola? Not on your life and so I produced a video to explain what I mean and why it is that I in fact totally agree with Coca-Cola's latest message that we should try to live like Grandpa (and yes, I know my collar looks funny).